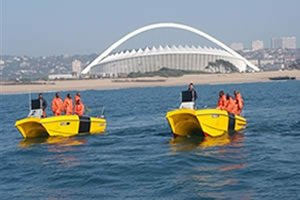 The only organisation of its kind in the world, the Natal Sharks Board protects beach users in KwaZulu Natal against shark attack with an extensive and effective network of shark nets that extend along 320 kilometres of coastline. The Natal Sharks Board is not only involved in preventing shark attacks, it also plays a huge role in research on sharks, and supports and promotes the conservation of sharks. One of their biggest balance acts is reducing the number of shark deaths in the nets, without jeopardising the safety of those using the beaches along the coast. It is interesting to learn that the recapture rate of sharks caught in the nets is only about 4%. Analysis of shark attacks over the last four decades shows, most importantly, that shark attacks are very rare, despite peoples’ inherent fear of these beasts of the deep. On average only six incidents occur a year, and since 1990 only 26% of attacks have been serious. Only 12% were fatal along the coastline from Mozambique border all the way to Table Bay in Cape Town. You can learn more about sharks and the Natal Sharks Board by visiting the complex in Umhlanga Rocks. Highlights of the visit include a display hall with lifelike replicas of sharks, fish and rays, an audio-visual presentation on the day-to-day work that the Natal Sharks Board carry out, and a 20 minute shark dissection.